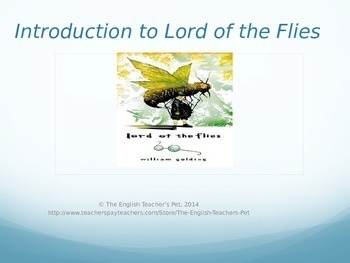 Need a good lecture to introduce your Lord of the Flies Novel unit? 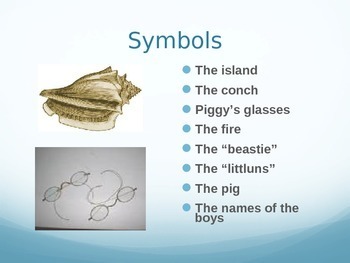 Included in this 15 slide PowerPoint of the Lord of the Flies is a background for the author, William Golding, the WWII historical perspective and allusions from today's pop culture, an introduction to the characters and themes to look for while reading, symbolism in the book and the literary elements used by Golding. I have also included guiding questions to start discussion with your readers, such as "Does every human being have a dark side? Are humans inherently good or evil? What does it mean to be civilized?" and many more. Ready to start discussion today with your class! 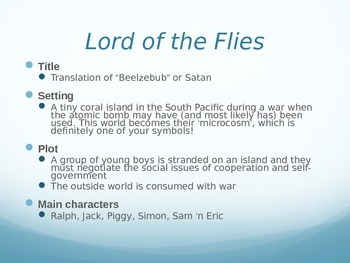 Lord of the Flies 3 Projects.